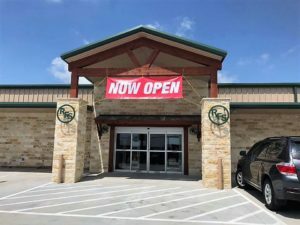 We are excited to announce that our brand-new Russell Feed & Supply Crowley location is NOW OPEN! Our new 12,000-sq.-ft. facility is located right next door to our original Crowley store, at 1625 N Crowley Road. We’ve expanded our hours to serve you better. Come see us Monday through Friday, from 8 am to 7 pm, Saturday, 8 am to 6 pm and Sunday 11 am to 5 pm. We’re still putting the final touches on our new store and when we’re finished we’ll offer a propane refilling station, new pet room, and an expanded offering of feed, pet food, and lawn and garden supplies. Stop on by and let us know what you’d like to see stocked in our new facility—we can’t wait to serve you. Russell Feed & Supply is dedicated to delivering the best service and products for our customers. Visit one of our eight family owned locations for feed, supplies, and expert customer service. This entry was posted on Wednesday, January 18th, 2017 at 2:33 am	and is filed under News & Updates. You can follow any responses to this entry through the RSS 2.0 feed. Both comments and pings are currently closed.